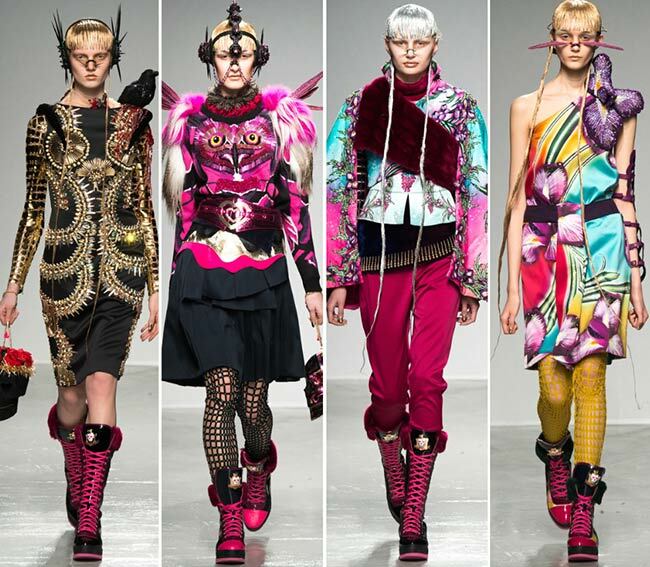 We are not quite sure what was going through Manish Arora’s head when he came up with the styles that would totally change the perception one has of a fashion show. We may even be wondering which planet the Indian designer is from, for we don’t know the last time we saw owls turning into skulls that had hearts instead of eyes. 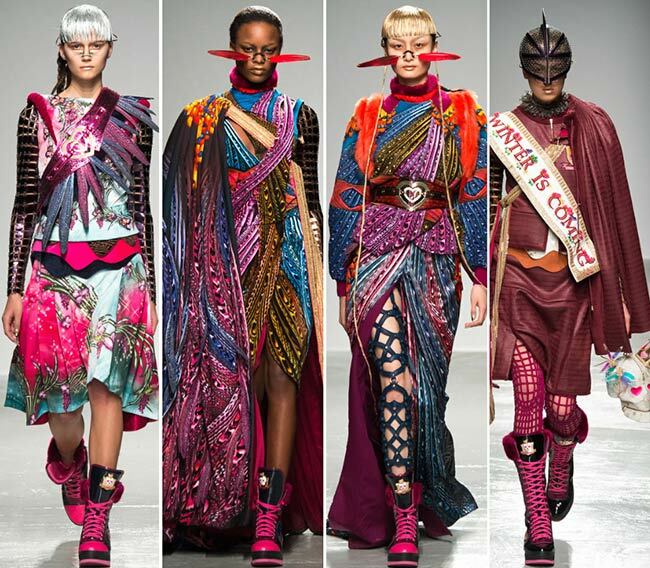 What we do know that the final outfit of the 44 piece long Manish Arora fall/winter 2015-2016 collection states that winter is coming and is quite reminiscent of the “Game of Thrones’ series depicting a world, in which the summers are long and the winters much, much longer. That final banner strewn across the soldier’s body makes some of the themes found in this collection a little more understandable, from the elk to the owls to the grinding spiked golden gears printed on one dress. The skulls appear throughout and we dare say that the raven appearing perched on the shoulder would have three eyes. There is even one warrior in mock chain mail whose skirt carries the emblems of different Houses that rule different parts of the world envisioned by George R. R. Martin. Now that certainly can explain why there are plastic birds and dragons perched on models’ shoulders all throughout the showing of this particular collection. 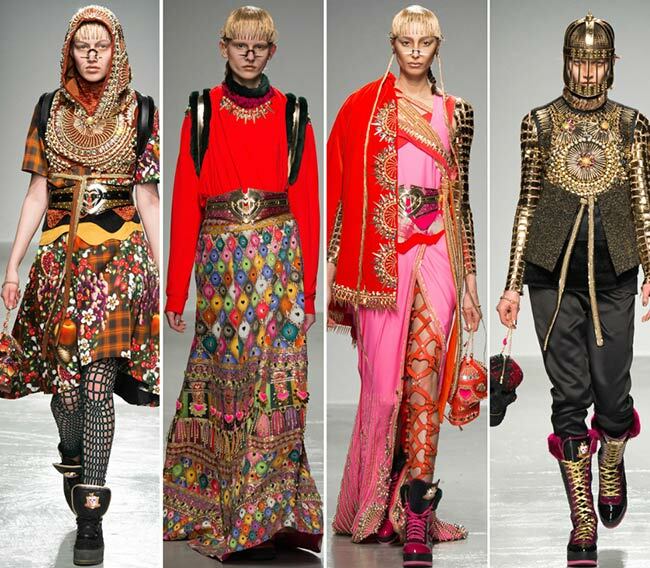 Manish Arora never creates any designs that can be considered dull or mainstream. On the contrary, it appears as if the most fantastical of worlds are always his inspiration, having been so since his eponymous label’s launch in 1997, his debut on the India Fashion Week and the Hong Kong Fashion Week three years later, and definitely has been so since his first debut on the London Fashion Week runway in 2005. 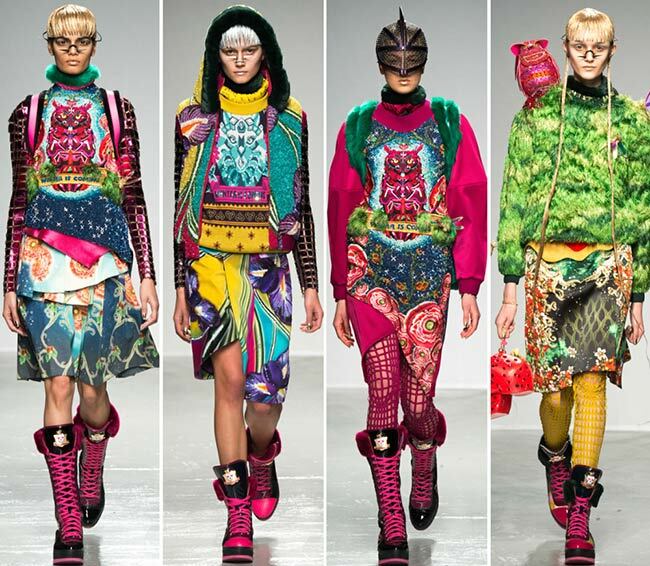 He is pretty much the John Galliano of India, tamely described as using a rich palette of psychedelic colors and kitsch motifs in his pieces, combining the Indian styles with the Western silhouettes. 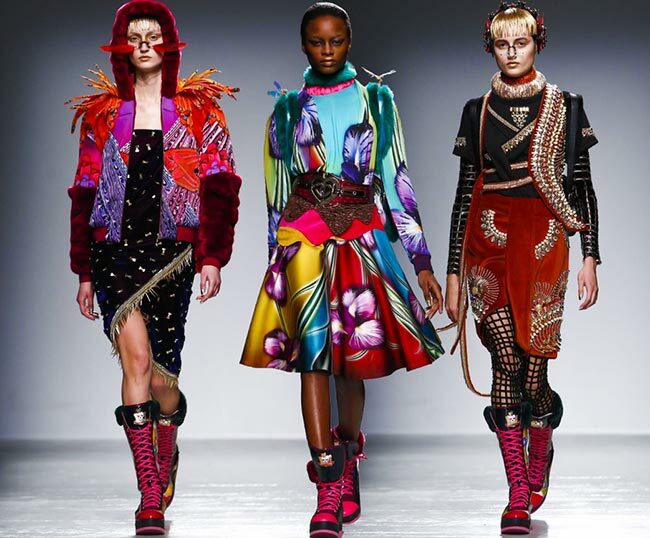 This can definitely describe the latest of his collections presented on the Paris Fashion Week runway, wherein we are thrown for a look with the incredible use of colors and textures, essentially having us feel as if we are on a drug trip throughout the whole of the show. It is almost “Alice in Wonderland’ style, what with the imagines making up images themselves, the models holding skulls with roses growing from their heads and the dresses that are a little more normal perhaps, with a multitude of beautiful colors and gorgeous large floral designs.